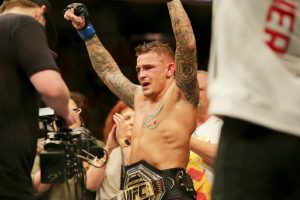 Dustin Poirier and Israel Adesanya walked out of the Octagon on Saturday night as champions, and it had only a little to do with the shiny new title belts they carried with them. Their performances in the main event and co-main of UFC 236 in Atlanta made them interim champs, which is to say that neither man sits alone at the top of the mountain in his weight class. But the fights they put on — digging deep to find moments of dominance when they needed to set a tone or change momentum — elevated them both to a status few fighters reach. This has been a long time coming for the 30-year-old Poirier, who has been competing as a professional mixed martial artist for a decade. Saturday’s fight was his 22nd in the UFC — the second-longest wait a fighter in the promotion has had to endure for a title shot, behind only Michael Bisping’s 26 bouts — and his résumé is dotted with near misses. He has paid his dues, and when his opportunity finally came, he went for it with a vengeance. Poirier took it to featherweight champ Max Holloway from the start of Saturday’s headline bout, wobbling him several times in the first two rounds. But it was in the third round — a round Holloway won — that the son of Lafayette, Louisiana, truly showed championship mettle. He withstood the best that “Blessed” could dish out, despite looking tired and slowed from the fast early pace he’d set. Then Poirier somehow rediscovered that higher gear and made the championship rounds live up to their name, bloodying Holloway with a big knee in Round 4 to turn the fight back in his favor. Then he took it home to secure the interim lightweight belt. Turnaround was also at the heart of the Adesanya story, and in an unexpected way it grew the legend of the 29-year-old native of Nigeria, who has lived in New Zealand since his teens. Adesanya went into his interim middleweight matchup with Kelvin Gastelum as an enigma. He had had only five UFC bouts, yet he was considered the next big thing. Gastelum represented his biggest test yet. Yes, it’s true that “The Last Stylebender” shared a cage two months ago with Anderson Silva, one of the greatest of all time. But “The Spider” Adesanya faced at UFC 234 was a faded 43-year-old version. Adesanya’s most dangerous opponent that night might have been himself, as he was stepping in with an idol and at times struggling to get out of his own way. Saturday’s fight was Adesanya’s first against a ranked opponent. (Gastelum is No. 3 in ESPN’s middleweight top 10, with Adesanya at No. 7.) Could he show the flair and flash that he’d put on display in his previous bouts? The simple answer was no, but the rest of the answer is that he showed something more important. Adesanya was poised from the start, in no rush to show off. The story of the fight early was not the shots Adesanya was landing but rather the shots Gastelum wasn’t. Gastelum’s footwork and head movement were masterful. But the thing that’s midway between his head and feet proved to be Adesanya’s most potent weapon — his heart. After the crafty veteran Gastelum found ways to clip him and put him in deep trouble as the fourth round wound down, the fight appeared to be slipping away from Adesanya. But Adesanya came out for the fifth round and seized control, knocking down Gastelum three times in those final five minutes and nearly finishing him. This was more impressive than any of the front-running performances he’d had before. These championship performances by Adesanya and Poirier surely earned the attention of Robert Whittaker, who holds the middleweight belt, and Khabib Nurmagomedov, who reigns at lightweight. They’ll soon return, and waiting for them are challenges that at this moment seem bigger than they did 24 hours ago. Adesanya was already a star on the rise, but now he has shown himself to be multidimensional. He’d been so dominant that in the past he’d never had to prove he could stare down adversity. Well, now he showed he can, and that’s huge, because fights at this high level are a breeding ground for adversity. That fifth round against Gastelum — how he transformed from depleted to dominant when toughing it out was his only option — was the stuff of legends. Gastelum had been in with five UFC champions in the past, and no one did to him what Adesanya did. That has to give Whittaker pause. As for Poirier, he showed off power and precision that have to concern Nurmagomedov. Yes, the Dagestani last faced a powerfully elite striker in Conor McGregor, but that fight mostly didn’t take place at ideal striking range, where the champ is at his most vulnerable. Poirier kept Saturday’s fight in his range, controlling where the action took place. If he can keep the Nurmagomedov fight standing long enough to clip him with what he dished out to Holloway, it’ll be interesting to see. That’s the bottom line, right there. The two classic fights that closed out UFC 236 stirred up deep intrigue over what’s to come. Who doesn’t want to see Whittaker vs. Adesanya — especially in Australasia — and Nurmagomedov vs. Poirier? Heck, who doesn’t want to see what’s next for Holloway and Gastelum as well? When fighters bring forth that something special that carries them through the most difficult times — and when those times have the highest of stakes — it is deeply satisfying to witness such spirit. We could never imagine being in that line of fire, yet we cannot look away. We want to see more. And Saturday night brought the promise that more will soon be delivered.